7 How should a blazer fit? Wearing jeans and blazers are a surefire way to pull off the smart-casual look. 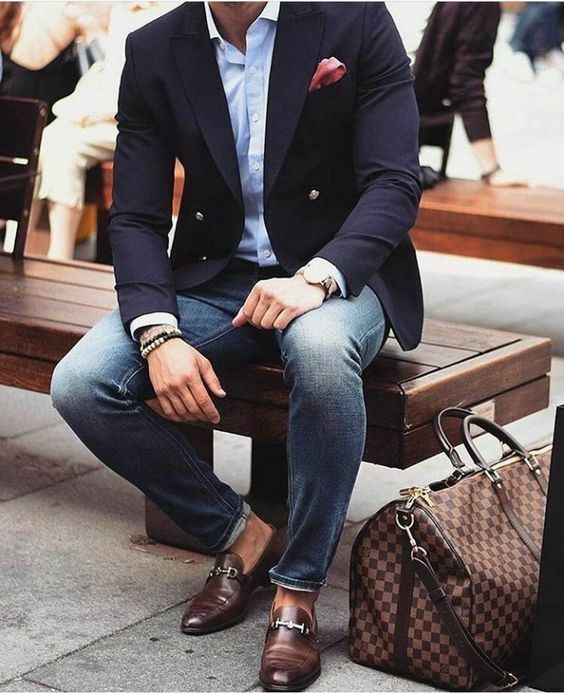 You cannot go wrong pairing jeans with a fitted blazer jacket. In our books, this combination is classic. In this timely guide, we will be showing you how to wear jeans and a blazer to get the most out of this wardrobe essential. Most people think wearing a blazer and a T-shirt are the easiest thing to pull off. Ideally, that should be so, but there are people out there who fall short of the required standard. Blazers and T-shirts are basic staples wears in a man’s wardrobe and are the go-to wears for last minute plans. Although they are very popular, there is still a good chance that you will be better dressed than some people in any function. If you want to create a laid-back and casual vibe, opt for a beige or black blazer with a white T-shirt. The white base brought about by the T-shirt will give you plenty of room to accessorize. If you are going the t-shirt and blazer route there are ways to add extra layering in case the weather gets cooler. 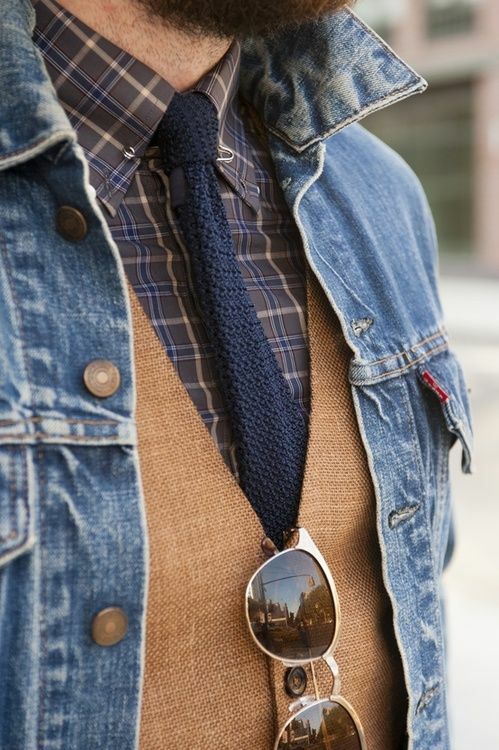 One of such ways is to layer up with a denim jacket. The denim will give an extra level of warmth on cooler days. This layering style also ensures that when the weather gets hotter later in the day you can take off your jacket and still be put together. Oxford shirts are a steal with blazers. Anyday, anytime they work well, just make sure you don’t go overboard with colors. If you pair an oxford shirt, blazer, and slim cut jeans together, what you have is a match made in heaven. 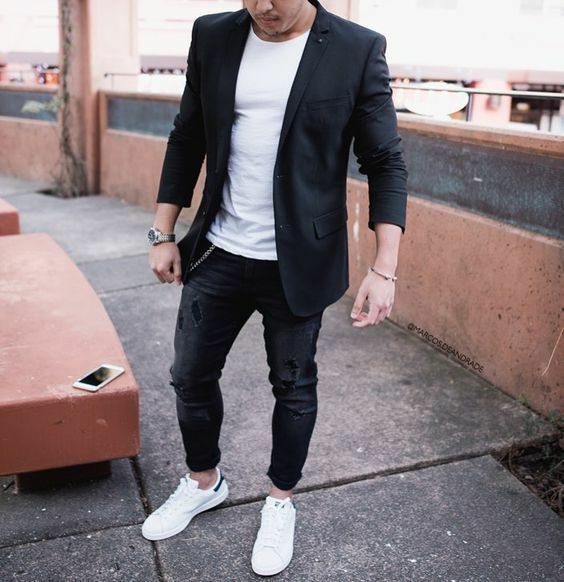 Putting on a classic black blazer on denim jeans is one of the most common and clean-cut ways of wearing jeans with a blazer. This combination is not expensive and can take you from work to the bar. If you use a black jean then you will be at liberty to choose a t-shirt color that suits you. If you want to spice things up a bit, try different textures and color to find what works for you. If your dress aim is smart-casual, blue jeans with blazers are heads and shoulders above the rest. With this combo, you have the best of both worlds at your fingertips. 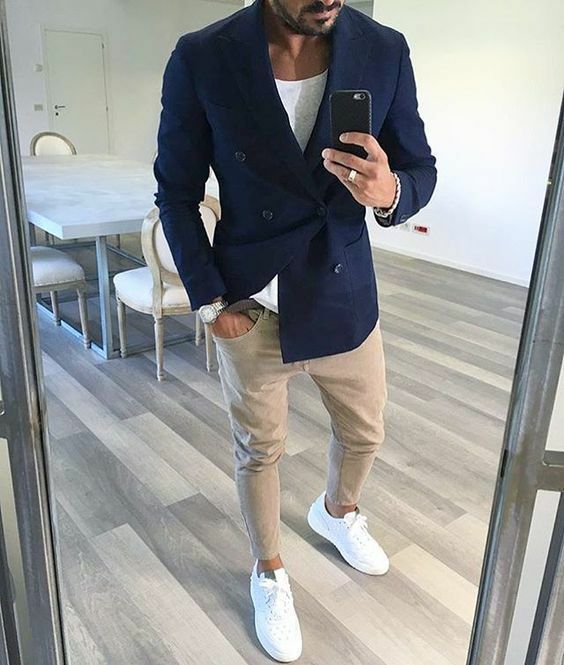 A smart blazer and casual blue jeans. The blazer is structured and very refined while the blue denim jeans are very casual. For those early morning rush to the office or a casual date night out, you can’t go wrong with a blazer and blue jeans. They can easily transit you from office to drink out with friends. To switch up your look, try pairing grey jeans with a blazer jacket if black and blue jeans are not just your thing. This combination is perfect for autumn and winter style. Grey jeans are quite easy to style, just as you would do for black or blue jeans. Pair them with neutral colors like black or Navy and you will do just fine. For some looks, a monochromatic approach could go well. Just don’t try the double; grey jeans and grey blazers are a no-no. If you are the bold type and you like experimenting with colors then a bright looking blazer could really tickle your fancy. During summer try on some light pastel colors like pink and blue while you could try on darker shades during winter. Brighter colors have an edge over others in terms of offering a bit of personality to your dress attire. Keep your jeans simple if you use bright colored blazer to tone down the effect a bit. Don’t opt for too much detail with the rest of your attire. Keep things simple. Stick to a neutral pair of blue jeans matching your blazer with a simple white shirt. 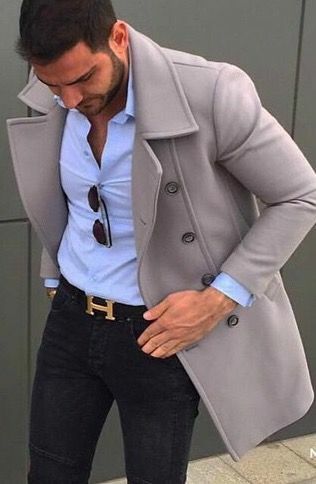 If you prefer a bright colored blazer, pair it with skinny white jeans to achieve a summery vibe, keeping the rest of the outfit as simple as possible. In this case, less is more. You are not limited by color alone. You are at liberty to opt for other designs like prints. If prints are your thing, pair with black jeans to lower the attention drawn by the blazer. The sleeves ought to be slim fit and just fall above the hand. To look dapper, a blazer ought to be tapered to the waist region. However, avoid skin fitted blazers if you are very slim. When it comes to length the blazer you wear should just fall a couple of inches below the hip bone. Fit your collar properly resting the jacket collar against your t-shirt collar. Keep your jeans slim fitted and tapered if you are to achieve the smart-casual look properly. 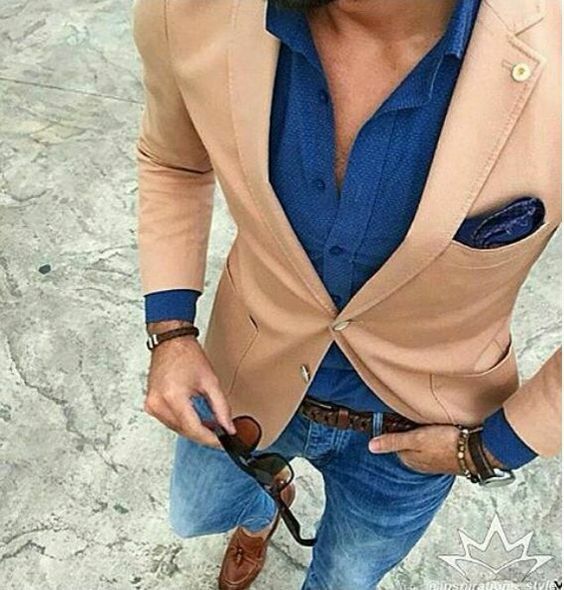 The color contrasts between your blazer and denim jeans must be subtle. Use neutral jeans to drawn attention away from a bight colored blazer. Reduce gathering by making sure the length of the blazer is appropriate. Wearing a blazer and jeans is one of the easiest dress combos to pull off. However, there is no harm in learning a few tricks in the smart-casual dress trade. Hope this little guide did justice to inform you properly. Like we always say, try to keep the colors complementary. If you are in need of a relaxed look, an outfit that can easily transit you from office to the bar then the jeans and blazer combination is your best choice. This combo is stylish and will remain trendy for a long time to come.